Real Time Feeder is the utility which updates Real Time, IEOD and EOD (nse) data to the best charting software Amibroker. A New Version of Real Time Feeder ( RTF - 2.0 ) has been released with some additional features. click here to get it. Today almost all broker provide the Trading Terminal which has a facility to export the watch list to Excel sheet, When you exported you watch list to excel sheet you will get streaming live quote is excel . RTF updates the Realtime Tick data from excel to Amibroker. Step 1: Create a watch list in your trading terminal. To update tick data we must need Symbol, Latest Time, Latest Price and Latest Quantity column in watch list (you may add other columns if you required but those columns are not necessary to get tick data). Step 2: After creation of watch list, open a Excel sheet and copy the watch list from Trading Terminal and paste it to Excel sheet (to paste the watch list in excel, select the A1 cell in excel, right click the cell and press paste. Remember when you paste the watch list to to Sheet 1 and you should not change the sheet name, it should be Sheet 1 only. After pasting the watch list to Excel, in excel time column should looks like hh:mm:ss (hour:minute:second) format. If time is not looking this format, you should format excel column (see help file available in the software to know how to format). Step 3: Now open RTF, Go to > Settings > RealTime. Here you have to do important setting i.e. you have to specify the required excel columns in RTF. Under Symbol field specify in which column Symbol is presented in Excel. For example, in excel if symbol is presented in Column A then you have select Column A under Symbol field. Under Time field specify in which column Time is presented in Excel. For example, in excel if Time is presented in Column B then you have select Column B under Time field. Under Latest Price field specify in which column Latest Price is presented in Excel. For example, in excel if Latest price is presented in Column C then you have select Column C under Latest Price field. Under Latest Quantity field specify in which column Latest Quantity is presented in Excel. For example, in excel if Latest Quantity is presented in Column D then you have select Column D under Latest Quantity field. After all these settings press SAVE button in RTF (see help file available in the software for detailed help). Step 4: Open Amibroker, in Amibroker you should do the necessary settings (see help file available in the software to see the amibroker settings). Step 5: Now in RTF main window press Start RealTime Update button. Now in status teller window you will get a massage that "Excel is Connected and Waiting for Dtata to Change". When data started to update you will get a massage that "Tick Data is Updating to Amibroker" with Green background color. We would suggest you to start RTF 1 or 2 minutes before market starts (i.e before 9.15 AM ) so that you will never miss single second data. If you press Start RealTime Update button before start of normal market hour (i.e 9.15 Am), Amibroker will not display pre-open market data. Do all the settings required to get realtime tick data as explained above. Before pressing Start RealTime Update button, press Start IEOD update button, after completion of IEOD update immediately press Start Realtime Update button. now you will able to get missed intraday data as well as realtime tick data. Select the required Exchange under Exchange List menu. Add the required Symbol in Manage Symbol button. Select the check box Update IEOD data to Amibroker. Make the Intervals to 1 Minutes and Days to 1 day. How to Update IEOD Data? RTF downloads IEOD data from Google Finance it supports 21 stock exchanges in the world. Select Settings in main window, IEOD configuration section will open. Select the required Exchange in drop down exchange list. Add the required SYMBOLS in Manage Symbol button (see help file for more info). Specify the required Interval and Days of data in the box. You can get minimum of 1 minute interval data and maximum of 60 minute interval data. You can download maximum of last 15 days data. If you don't want to update downloaded data to Amibroker then you can uncheck the Update IEOD Data to Amibroker check box. After all these settings press save and press Start IEOD Update. How to Update End Of Day and Historical Data? RTF downloads and updates EOD and Historical data (equity and futures) of National Stock Exchange of India. Data is directly downloaded from NSE website. let's see how to update EOD data. Select Settings in main window. Go to EOD in configuration section. Select the required "From Date" and "To Date". Select required Check Box. To download Equity data select the Download Equity check box, select Update Equity to Amibroker to auto update downloaded equity data. To download Futures data select the Download Futures check box, select Update Futures to Amibroker to auto update downloaded Futures data. You may select both Equity and Futures or any one as you required. After all these settings select SAVE and press Start EOD Update in main window. Sir Getting error in realtime update Error "There was some error while updating Amibroker"
Close the excel, ami and RTF and then re launch it. 16 January 2015 at 09:21 delete This comment has been removed by the author. As of now there is no free data source is available for future data. You can use this software with trial and registered versions but trial version of Amibroker doesn't save any data. ok sir thanks but some other method . you cannot get intraday futures data using RTF. thanks sir but other data provider give futures data how it possible ? We are giving data from free sources, there is no free source available for futures data and no one is giving futures data for free. try to make little software that fetching data from terminal chart data... most of terminal like nest now odin tt etc providing intraday chart with tick format data saving... use this data for backfill as per fut data concern its very usefull... it is possible to make this type backfill fetching software..
We will try to make useful software's in our free times, thanks for your suggestion. How to get google finance data? Please read How to Update IEOD Data? in above section or read help file which is included in our software. Got error msg "Unable to create files to get started. Please relaunch the application"
Relaunch the application, If you get same error then restart your pc and then check. how to get data in excel file . i dont understand the concept clearly. To get data to excel, copy the watch list from your trading terminal and paste it in excel sheet. check out our help file in software. I installed RTF but unable to launch it (It stuck with the first image of the tool). May be JRE is a problem. Please let me know, which version is necessary for launching RTF (not the latest one one), I am still using Windows XP and the latest versions are not configurable on XP. I have jre-7u76-windows-i586 installed. JTE 7 is fine, try to re install the JRE and RTF, if problem continues you have to re install the operating system. sir can we get nifty options data ? Your software is very nice and more auto too. I am sure with a little improvement here and there it can become much more powerful. With expertise of ur kind, it shud not be difficult to do some symbol mapping and then draw future data. On terminal (I use ZT zerodha terminal), stock future is shown as : eg. TATASTEEL15julFUT while on amibroker we show it as TATASTEEL_F1. Similarly stocks on terminal are like TATASTEEL-EQ while in ami we show it as just TATASTEEL. I also feel there should be a way to selct only some symbols for real time update or today backfill .. For instance, I maintain an IEOD data base for around 80 symbols and 30 futire stocks. I added them in RTF symbol list. Now when I press Start update realtime button or Start IEOD update, software naturally tries to update all. But practically we need realtime update of just a few select ones.. if there is way to selct those. that woud be so nice. Dear Manu Adam, You can can download ieod & realtime data of only required symbols, just add the required symbols in symbol list and also create a wachlist of required symbol in trading terminal so that you can download the data of required symbosl. 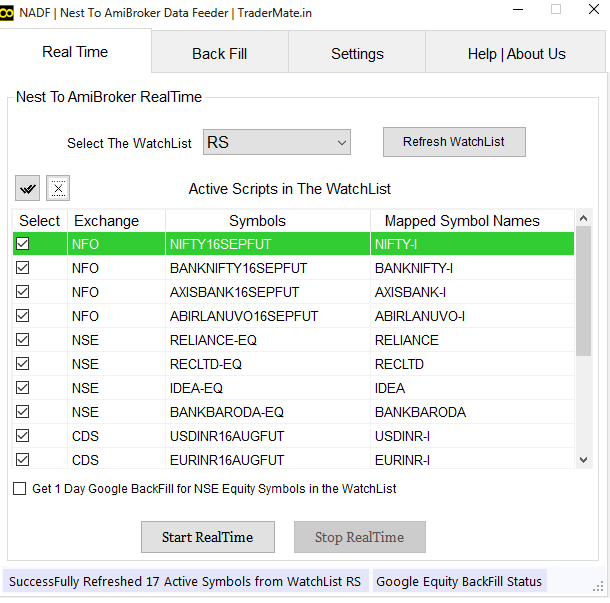 RTF downloads the data of those symbols which are in symbol list and watchlist. We will try to improve our software in coming days. How can I get EOD of custom List rather than whole equity..? Looks like a good application. I downloaded and tried IEOD and EOD. 1. IEOD - Download worked but auto update did not happen. 2. EOD - tried 2010-2011 download, on first VIX download application hanged. 19 November 2015 at 14:29 delete This comment has been removed by the author. 19 November 2015 at 17:15 delete This comment has been removed by the author. Sir, this utility is not working on Windows 10 (64 Bit). how I can run this utility on mentioned version of windows. I am following your videos and testing RTF. I have one question, I setup NSE index futures and stock futures in my watch list and exported them to excel. Done changes to excel as you explained. Till that point everything was fine....but next things doesn't happened. Does this feeder takes futures n options data? or not? BANKNIFTY17JULFUT -- BackFill Data is not available at this moment from server. It may be because this symbol is not present in the selected Exchange. NIFTY17JULFUT -- BackFill Data is not available at this moment from server. It may be because this symbol is not present in the selected Exchange.